Well, 9 days into our trip I've at last managed to get to an internet cafe to do some blogging and give you all some news of the trip (+ some photos). It's good news all round... everyone is well (despite the occasional minor upset stomach). 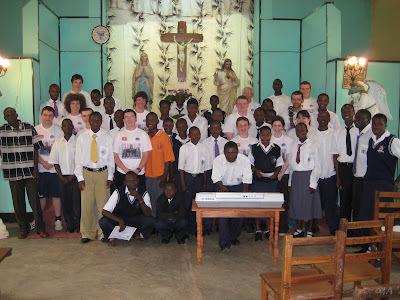 We have had days full of wonderful experiences, first in Kisubi (nr. Kampala, the capital) where we had a day's visits around Brothers' school and university campuses before staying our first night here in a lakeside residence owned by the Ugandan De La Mennais Brothers. The penultimate day... One of the wettest. A late start on the road (10.15am) due to staying for morning prayer with the Taizé community and other visitors/retreatants. 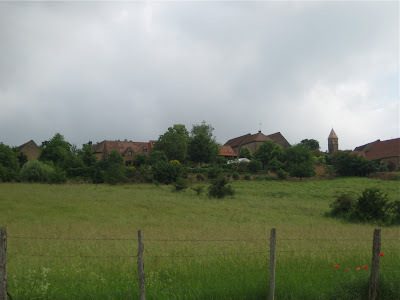 But as this was one of the shortest days (88 miles) I still arrived in reasonable time that evening at my stop over point, the parish presbytery in the village of St. Georges d'Espéranches, just south of Lyon. Traversing a very wet Lyon.